Industrialization is when businesses and governments collaborate to put in place the factors of production–raw materials, energy, supply chain, appropriately skilled labor, logistics, infrastructure, and public policy–to enable and support the success of a given industry. This partnership between the private and public sector occurs in the most successful examples of industrialization. Entrepreneurs and other businesspeople recognize a market opportunity that could result if they were to locate a production facility or warehouse in a particular region. The people who live in the region see an opportunity to use their skills and talents in perhaps a more productive way. The local government sees the potential opportunity for job creation and a tax base, and offers to help. 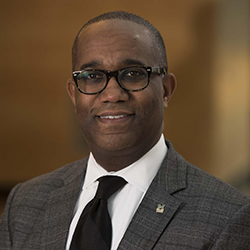 The help could come in the form of investment and tax incentives, education and training support at the local community college, public land leases, or roads, sewers, power lines, and other infrastructure development. If the region implementing an industrialization strategy has previously only operated in the farming or livestock businesses, the energy infrastructure may not be in place to support manufacturing. In most cases the nearest utility provider must be part of the private-public partnership to enable the industry to flourish in the region. All around the world and throughout history, periods of industrial development have followed generations of farming as the main driver of the economy in a region. Industrialization typically also involves the workers in a society trading in a relatively limited number of farming jobs for a significantly larger number of higher-paying jobs in factories, yielding growth in employment opportunities. These transformations in how the local population works also lead to mass numbers moving away from rural areas and making their homes in growing urban centers. 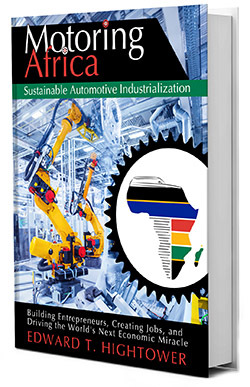 Sustainable industrialization is the next paradigm for industrialization. It involves a de- liberate set of strategic and tactical actions taken to optimize the discussed factors of product production for the long-term success and profitability of the business, while at the same time ensuring that the business has a positive impact on the environment, society, and local community. • Optimized Productivity & Cost Structure – Elimination of waste throughout the product design and production value chain to optimize profitability and long- term success of the enterprise. Optimizing product cost structure and operations through use of lean enterprise tools and methodologies. • Green Product and Operations – Optimal use of renewable sources of energy in the product creation, manufacturing, and distribution processes. Use of advanced manufacturing tools and processes. Responsible use of non-renewable energy sources. 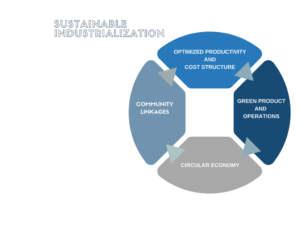 • Circular Economy – Implementation of circular economy strategies, i.e., maximizing opportunities for product sharing during its life cycle, and product restoration and repurposing at the end of its life cycle. Circular economy strategies should be factored into the design, manufacturing, distribution, use, and end-of-life reuse and recycling of the product. • Community Linkages – Responsible management of relationship between the company and the local community and stakeholders. This includes ethical labor practices and responsive community support.